It’s been a few days since I’ve written. A lot has gone down. First of all, they took care of those two jokers in Boston. That’s a good thing. Granted, it’s not much solace to the folks who lost their lives or were permanently maimed, but it means they won’t be hurting anyone else. 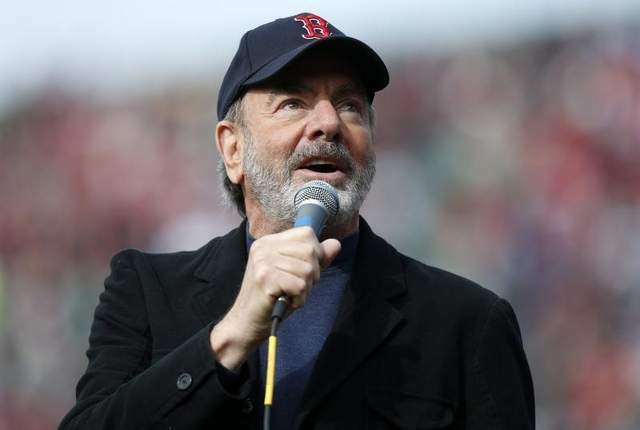 Secondly, Neil Diamond showed at Fenway Park to lead the crowd in Sweet Caroline. Granted, he was singing along with himself, which has to be a little awkward, unless you’re Bieber or any other of those modern-day hacks who can’t perform live to save their souls. At least he wasn’t lip-syncing. We had Marvin the glass man in yesterday to replace the first two of four windows. He did a really nice job. It’s so nice to be able to look at the window and see more than just moisture between the panes. There’s one tiny hole where the gasket doesn’t fit the frame perfectly, so I went downstairs to find some caulk. What I found instead was a big puddle under the water heater. The water heater is not fast, though, however, the feed pipe has a pinhole in it. So, I’m waiting for Rob the handyman to show up and fix it. I always say that it’s important to have a stable of people who can do this sort of stuff, so you can get it fixed promptly by people you trust. Other than that, the food intake has been improving, even if the toe isn’t improving that much. I’m still pretty bummed about that, but what can I do? No matter what I do, the tip of the tow rubs against the sock, the floor, or the Boot of Shame. I think I might have to have the podiatrist release the tendon that’s causing the toe to curl. Better than losing another toe. Back onto food, I managed to eat more scallops yesterday. They go down well and, more importantly, stay down. This is good. I’ve not had anything come up for two days, and I’ve had scallops and pulled turkey BBQ. Pretty yummy stuff. I can’t consume a lot of it, but that’s a good thing. Weight has continued to decrease. Am down to 321.0 this morning. That makes 59 pounds lost, which is a good thing. I can’t help but think how much I’d be losing if I could actually work out. I know… nothing I can do about it, but I really REALLY want to get back to it. Speaking of going back, I go back to work tomorrow night. I’m looking forward to it and dreading it at the same time. I’ll be glad for the work and the paycheck, but it’s the busiest two weeks of the year, so it will be a little crazy. Plus, I have to hope that my food continues to stay down. That would be awfully embarrassing. I’ll keep you posted. I did manage to get up this morning to watch the Bahrain Grand Prix. Red Bull’s Sebastian Vettel ran away with the race, but the two other podium spots belonged to Lotus, which made me happy, especially since Kimi Raikkonen finished second. He’s become my favorite driver, mainly because he spends more time drinking the giant magnum of champagne rather than spraying it. Gotta love it.